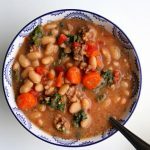 Dried white beans (or canned) are slow cooked and make an amazing soup with Italian sausage, carrots, tomatoes, kale and parmesan cheese. The flavor is unbelievably good! This soup is naturally gluten free. Heat a pan on your stove over medium high heat. Once hot add in the Italian sausage and break it up (I use this tool*). Add in the onion. Stir every minute or so until sausage is browned. Add to the slow cooker. Pour in the broth, carrots, beans, garlic powder, Italian seasoning and bay leaf. Cover and cook on LOW for 8-10 hours (for beans that have not been soaked) or 6-7 hours (for soaked beans) or 4 hours (for canned beans). Remove the lid. Discard the bay leaf. Stir in the tomatoes and kale. Dried beans vary in cooking times depending on how fresh they are. If your beans are older they may take longer to cook.